Tregullon is a peaceful hamlet in the middle of Cornwall - it offers easy access to all that this wonderful county has to offer. In less than half an hour you can either be at the north coast with it's wild surf and rugged coastline or you can be on the gentler south coast with it's pretty harbours. Bodmin Moor and the Eden project are both less than 15 minutes away. Sunnywell Barn is set in it's own private enclosed yard - it is not overlooked. There is plenty of parking and lots of room to play or just laze about knowing that you will not be disturbed. The barn was converted 8 years ago to a very high standard and was graded 4*gold by Visit England is 2012. The up site down accommodation has plenty of room for 4 people and is ideal for a couple, a family or 2 couples sharing. The May family have farmed at Tregullon for over 150 years. David, Jill & Richard now farm about 300 cattle (we stopped milking last year). About 8 years ago we decided to diversify into offering quality self catering holidays . Our aim was to make the farm sustainable so that our son, Richard, could continue to farm here. The holiday business was Richard's idea and is esentially his project - he helped to convert Sunnywell form a traditional barn housing calves in winter to a luxury holiday home. While doing this he was designing and getting planning permission to build luxury log cabins in a site next to the farm. In 2006 four lodges were built and have proved to be very popular. Last year we extended into a neighbouring field and have built 2 new lodges. We love living at Tregullon. Three generations of our family live here and David, Richard and David's father have never lived anywhere else. It is our little piece of heaven - it is peaceful but we are only ten minutes from everything that we need. There are several villages within a 15 minute drive that offer fantastic restaurants and pubs. Free Wi Fi access. There is good road access to Tregullon and it does take many minutes to get onto the main spine roads making this the perfect central base from which to explore Cornwall. A week is not long enough to explore everywhere so don't try to do too much - remember that a holiday is supposed to be relaxing! There is lots of information in the property about the local area and a beach guide. Open plan kitchen with oak units with built in dishwasher, fridge, oven & halogen hob. There is a microwave, kettle, toaster and lots of useful extras together with good quality crockery, cutlery & cookware. Lanhydrock golf course is less than a mile away. You don't have to be a member and there is also an excellent restaurant there. Notes on accommodation: Please note that we do not accept pets at Tregullon and we ask that guests only smoke outside. There is free wi - fi access We try to offer as much or as little help as you want to make your holiday a restful and memorable one. Outside: Sunnywell Barn is in it's own totally private grounds. there is a large concrete area for parking (and children with scooters), there is a patio with hardwood garden furniture and a grassed area. Sometimes there will be bullocks or calves in the adjoining fields. A BBQ is also provided. Utility Room: The utility room is a small barn conversion in the private yard of the larger barn. It houses a washing machine, tumble dryer, freezer and half size table tennis . There is a sink to clean off wet suits or golf clubs and lots of space for bikes etc Cleaning / Towels / Linen / Maid service: On arrival all beds are made up and there are plenty of fluffy towels left in the airing cupboard and tea towels in the kitchen. If you are staying more than a week we bring you clean bed linen and more towels. If you wish us to change the beds we will. Other: There are outside doors to both levels with a granite staircase leading up the rear of the barn to a door in the living/kitchen area. Inside there is a spiral staircase with open treads. In the downstairs hall is a bookcase full of books, games and DVDs. A fantastically equipped cottage everything one would need for a week from home. Being upside down with views on three sides was great. Jill the owner was friendly and unobtrusive. Brilliantly sited for visiting all areas. Bodmin a nightmare with its Road works hopefully the improvements will be worth it in the future. Weather was very changeable but managed to keep dry most of the time. Would recommend this cottage and location 100%. We stayed at the lovely Sunnywell property for our Honeymoon. 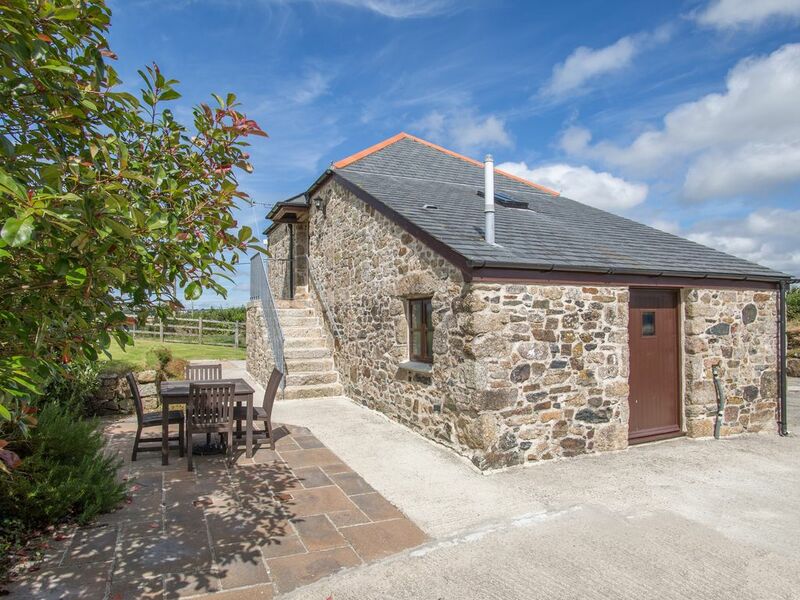 The cottage was in a perfect location to explore the rest of Cornwall but set in the quiet countryside. The property was lovey. Very clean and well maintained. We were made to feel very welcome with a lovely cream tea, some sparkling wine and chocolates. The owners even popped in on our first day to make sure we had settled in ok. They were very helpful and welcoming. We would definitely recommend Sunnywell to our friends and relatives and will definitely be planning a trip back there in the not too distant future. vriendelijke ontvangst door de eigenaars, het huisje was ok. In less than half an hour you can be on the north coast with the Atlantic sea crashing to shore. Polzeath and Newquay are a magnet for surfers but there are lots of brilliant beaches and coastal villages for the whole family to enjoy. In less than half an hour you can go the other way and find yourslef on the gentler south coast with it's pretty beaches and places such as Looe, Polperro or Mevagissey. We can help you arrange surf lessons or other activities. It is essential to have your own transport if you stay here. We are about an hour from Plymouth ferry port, half an hour from Newquay airport and 10 minutes from Bodmin Parkway railway station (where you could collect a hire car). Bodmin is 2 miles away and offers several large supermarkets, petrol stations, chemists, doctors surgeries and a minor injuries unit at the local hospital. Lanivet is 2 miles away and has one of the best fish & chip shop in Cornwall, a convenience store and a pub. Bodmin Moor starts at just the other side of Bodmin and we have books suggesting good walks or drives to see it at it's best.